Today has been a really good day. We had to get up early to join our tour at 8am, so we set the alarm for 5:30am and had breakfast sent in. I got to start the day watching another lovely sunrise. Our tour today was called " Hue and the Perfume River," and it seemed half the ship was either going on the same tour or leaving on a tour at the same time. This port is an hour north of Da Nang and 90 minutes south of Hue (pronounced "way"), so a tour in either direction was going to take a long time. Our 7 hour tour included a 90 minute bus ride each way, but it was worth it. Ray was stationed south of Da Nang when he was here in the 70's, so the bus ride gave him an opportunity to see how living conditions have improved for the locals since then. He was very pleased with what he saw. Vietnam has come pretty far since then. 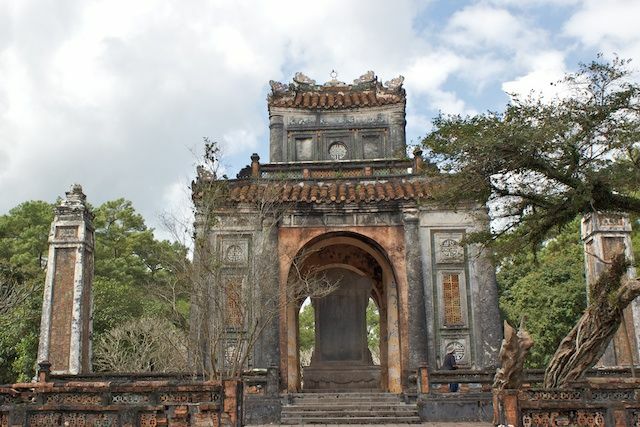 Our first stop in Hue was to visit King Tu Duc's tomb. 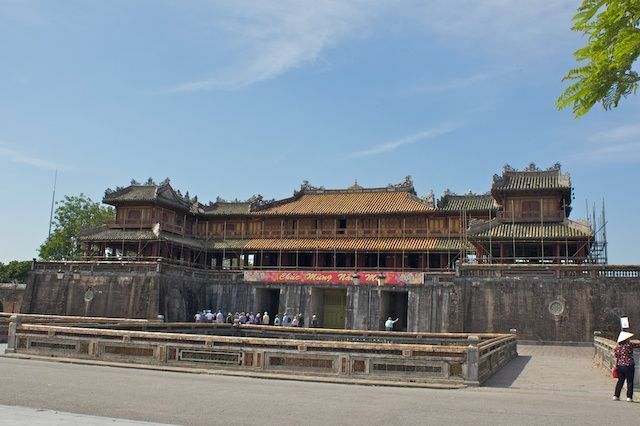 He was the fourth emperor in Vietnam's Nguyen Dynasty. He is considered the last emperor of Vietnam. There were a number of buildings here with artifacts from his reign. We were only allowed to take photos outside, not inside the buildings. I imagine, just like in other historic museums, camera flashes would harm the colors of the paint. 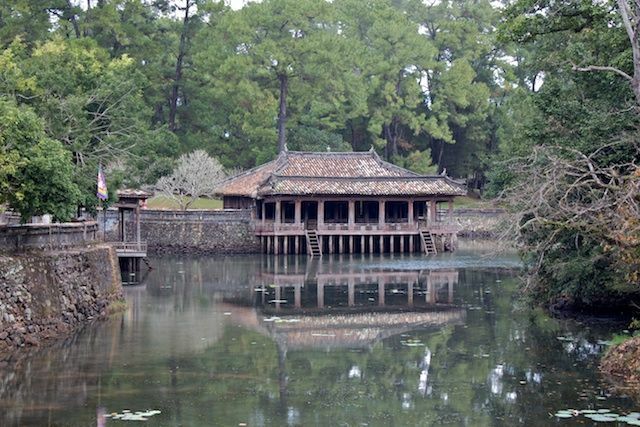 King Tu Duc lived on these grounds before he died. There were lots of steps going up and around this, as well as at the previous stop. Although the years and the weather have taken their toll on these buildings, the beauty that they once held is still apparent. It must have been a wonderful place in it's day. We made a short stop next at a place where they make the conical hats and incense sticks. They demonstrated their craft, but it was too small a space for me to get close enough to see. Mostly, I think this was a shopping stop. 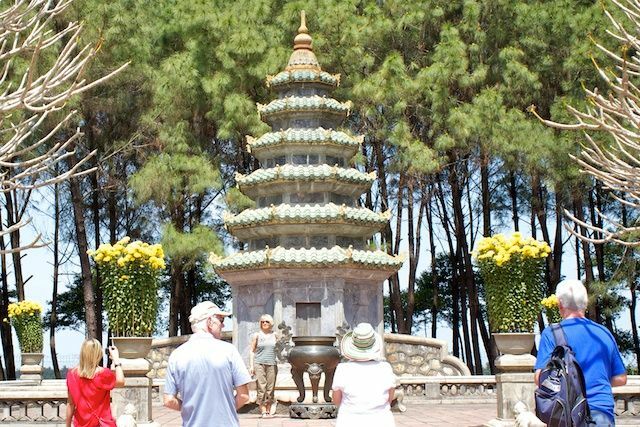 The Heavenly Lady Pagoda was next. This had a LOT of steep steps leading up to it. Later on we found out that there was an easier way in, along an incline path, and that's the way we went out. I am very glad we didn't have to go down those stairs. There were monks quarters on one side of the grounds and guest quarters on the other side, with lovely gardens in between. From there we walked across the street to the banks of the Perfume River and boarded a Dragon boat. We had a nice ride down the river to the Hue city center. There we disembarked and got back on the bus. Riding around the city, it is apparent that the city has 2 parts, the old and the new. We drove to the new section for lunch at a very elegant hotel. It was a wonderful buffet and Ray even found enough choices for lunch, despite his dislike for Asian cuisine. 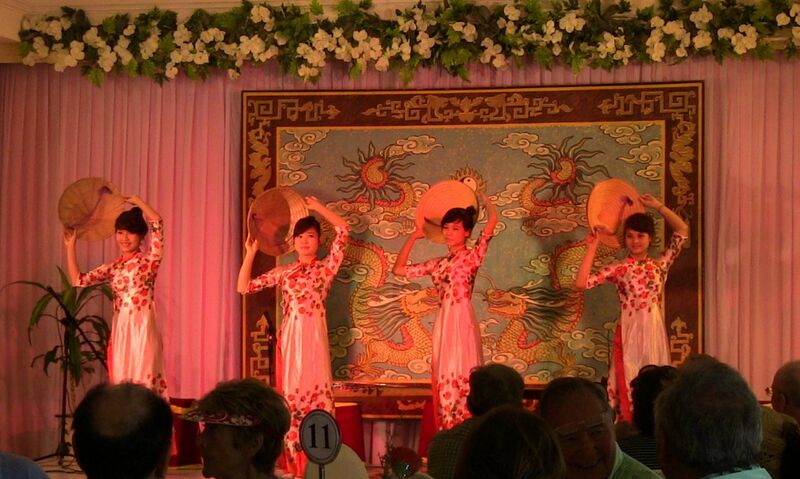 There was entertainment during lunch, alternating between a group of musicians playing Vietnamese instruments and a group of Vietnamese dancers. Our last stop was at the Citadel and the Royal Palace behind it. This is a huge complex that is currently undergoing restoration. It has been declared a UNESCO world heritage site. Many of the buildings were destroyed by floods in the early 1900's, but there is enough documentation for them to recreate what was lost. The work has just begun, and is being funded with tourist dollars. We walked around the palace grounds for almost an hour. By the time we were through, we were totally exhausted. Our guide, Ha, kept us at a very fast pace all day in order to keep to the 7 hour schedule. Even with her efforts, we got back to the ship about 15 minutes late. That was OK because the ship is staying in this port overnight. We are scheduled to spend 2 days at each of the Vietnam ports. 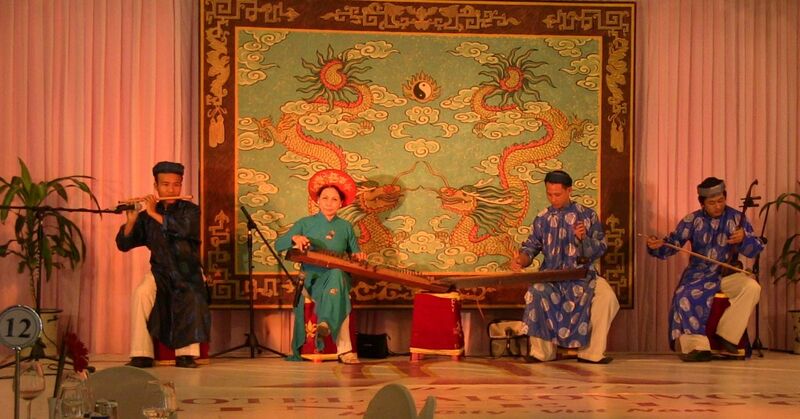 Vietnam is trying very hard to improve the lives of the people here, and one way of doing that is by promoting tourism. There are more people than jobs, and the tourist industry provides employment. For every bus that took people on tours today, 3 locals had work for the day, the driver, the guide, and a young assistant. There are also the mechanics, tour coordinators, and probably others who have jobs because our ship came to visit. To me, conditions appeared better in the countryside and towns in central Vietnam than in Saigon. We were told that many people flocked to Saigon from the country to find work, but even in the cities, there are only so many jobs, and those jobs require the right skills. There is no magic bullet. The people in the country work very hard, but they appear to have a better life than those who come to the city with no skills and attempt to eek out a living selling things on the street. I admire the hard working people we saw along our travels today.